It may be cheaper just to remove and get TRD Pro badges - that’s what I did. 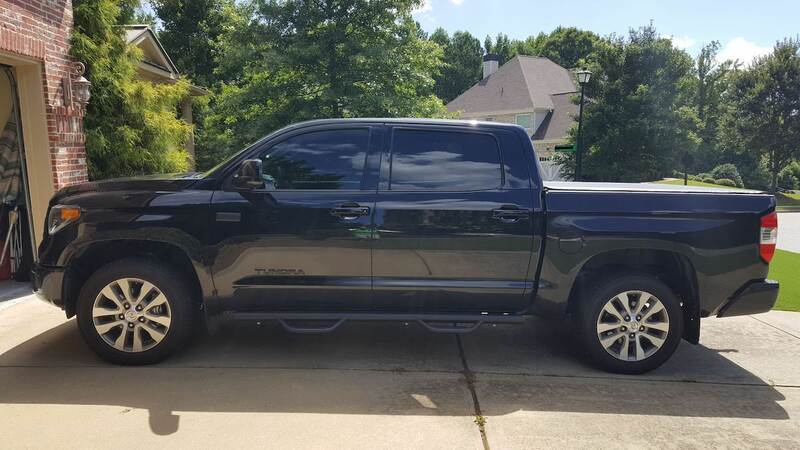 040Tundra and BTBAKER like this. Brownsfanhere and 4x4_Angel like this. Anyone know if they make black replacement or overlays for the "limited" badge? I’ve never seen the black overlay for the limited, 1794 or platinum badges. You can get the 4x4 badges in black though. Plasti-dip or paint is your best bet. NewImprovedRon, 4x4_Angel and KnuckleHD like this. Thank you, I haven't seen yet them either... I know a lot of people plasti-dip their badges and have good results but I'm still worried about the longevity. I wash my truck weekly with a pressure washer and don't want to worry about whether or not I hit the badges. Mnorris1206, NewImprovedRon and OBXTundra like this. I plasti-dipped my short antennae (reviews on Amazon said the carbon fiber wrap faded in the sun & I didn't want to pay $30+ for an actual black antennae) in May 2017 and it stills looking like new, no fading or cracking even in the Texas/Louisiana sun every day. As long as you take your time & make sure to spray multiple coats evenly & letting it dry, get in between the cracks & under side of the badges I wouldn't see an issue with washing. I did learn my lesson in my teens and power washed a grill from about 6 inches away & peeled the outer layer off. Just like power washing anything on your vehicle you shouldn't get too close or focus on that section for too long. I got mine from Amazon for 99.00. They have real badges now for not much more. I think they do. Someone on here got them. I decided to remove the Limited badge, mostly because it catches dirt and water. I do know a few companies who make custom one off plastic and billet metal badges. They will probably cost $150 or more for a pair though. Looks like the seller pulled the overlay badges from eBay and Amazon. They do have them on their website, just without free shipping. I just installed the overlays on my limited last week I think they look great. viha22 and Buse like this. Removed them. All I’ve got is the black replacement TUNDRA door badges and 4x4 at the back, super 3M sticky, eBay. Makes washing easier. TundraDude18, Mediumrarepls, Brownsfanhere and 1 other person like this. Thanks everyone, guess I didn’t look hard enough the first time. I’d prefer to have OEM replacements from Roman but they don’t sell the limited badge. Just purchased these overlays from Nox-Lox. Great customer service over the phone. $100 for the entire set including the limited badge. Just ask them to swap out the SR5 for limited badges. We’ll see how they work out. I went with the Nox-Lox overlays too. So easy and so fast. NewImprovedRon, Tony v and KnuckleHD like this. Nox-Lux are great, I just bought the kit for my 2 week old 18 cement CM. I could not be happier and they were easy to put on. I watched the video they have on youtube to place them on in a downward pressing fashion. I would watch the video because I saw another video of someone putting them on but they could still see a thin line of chrome closest to the body. I plasti-dipped the emblems on my old truck and I have to say I prefer the overlays. I did the same. Worked out great. Tip: make sure to clean the badges with rubbing alchohol first. Makes everything stick better. It seems Nox-Lux has pulled the badges from their site also. Wonder if they ran out or if they quit selling them? I got mine recently. I would call em and ask if interested. I called to ask questions about mine being a 2018 and their customer service was great. They answered all my questions so I’m sure they can elaborate on that. I called them this morning to check, because I want some also. They said they were out of stock and would be back in-stock in 4-6 weeks. Try the search function. Quite a few threads on this topic. Fantastic, thanks for calling them and for the update. $38 for the entire kit on Ebay. I bought it figuring 'why not' and they are actually very nice. I just put them on this morning.